Submitting work via JPEG requires you start with a good photo. Always shoot your image without glass! Reflections will distort the actual color. Try to take your photo in sunlight, preferably in shade. Neon light gives a blue cast, incandescent light gives a warm cast and LEDS can wash out the color. Compare the image to your painting, match color as close as possible. If possible, set your device to ‘Adobe RGB’ color calibration, a standard and popular setting to provide accurate color across platforms. Set your resolution of the camera to give you a large file. The file can then be resized to submission specs. Submitted images must have a resolution of 300 dpi with 1800 pixels longest side length. In computing, JPEG, is a commonly used method of lossy compression for digital photography (image). The degree of compression can be adjusted, allowing a selectable tradeoff between storage size and image quality. JPEG typically achieves 10:1 compression with little perceptible loss in image quality. JPEG are most effective if stored in the RGB color space (computer monitor, tablets, phones all use RGB color. )Is the resolution a factor when creating a JPEG? If you are going to print on a conventional press or make prints via the giclee method, the resolution factor is very important. The resolution should be no less than 300dpi (dots per inch) at 100% the size of the final print image. The higher the dpi, the larger the file size. If your painting is 10″x12″ and you want to print the image professionally, the final JPEG must be 10″x12″ at 300dpi or more.What resolution on a monitor? The resolution that can be achieved on the typical computer screen is 72dpi. A JPEG displayed on a computer screen at 72dpi at 100% will look perfect if the photo is taken under the right conditions. 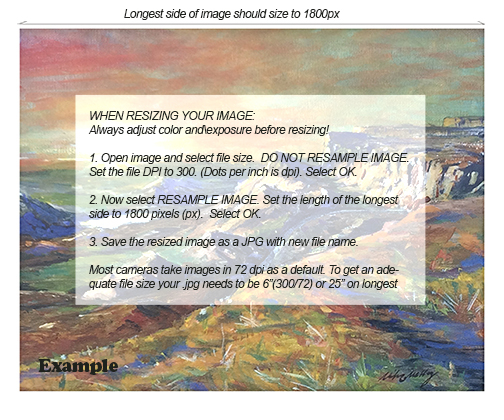 You can always reduce the size of a 72dpi JPEG but never enlarge one over 100% when displaying. On this web site, the gallery photos are 500 pixels on the long side, 72 dpi. The thumbnails are 120 pixels on the long side, 72 dpi. The smaller the file, the faster the load.Why are the recommended submission size 1800px on the longest side at 72 dpi if they are being viewed on a monitor? A JPEG that is 1800px x 1350px @ 72 allows the judges to “zoom” in to see detail and color when evaluating a painting. File size at this specification should be 1BM to 1.5MB. What about color space, what is it? The color profile is assigned by the camera device or can be re-assigned in a photo editor. Typically, the standard digital camera assigns the sRGB IEC61966-2.1 color space or a version thereof. Photoshop default is often Adobe RGB(1968). This is the preferred standard among professional printers. Assign the color space and then adjust the photo to match the orignal. How do I know if the judges computer monitor displays my image the same way as my computer monitor? You don’t and you can’t. That is why the judges can’t really make final decisions prior to actually viewing the work. They can narrow down their choices but they must view the original to know exactly what they are seeing. Your challenge is to create a JPEG that is well lit, sharp and in focus, correct size and displays well on a number of various computer systems. Take your image in indirect sunlight, try to get the picture plane of the camera parallel to the surface of the painting to eliminate distortion. FOCUS. Adjust the image to best represent the original using the levels and hue adjustments in an editing program. If possible, check the final image on a number of monitors to see what you have. Or, take it to a professional photographer, get a high resolution image created (300dpi at 100% of original size) and then resize the file to the submission size. Follow instructions below if asked to email your images directly to an email address. Or, submit via the submission form when available. These instructions use Windows Vista and Windows Mail. Before you begin, you will need to know where your photo is stored on your computer so you can locate it. Save As or Rename your photo as follows: last name in CAPS + first name in lower case, and the title of the painting. Example : DOEjohn _landscape.jpg. The file format must be jpg. Crop your photo so only the image of the painting is showing, the image is straight, and the color and exposure are as true to your painting as possible. You will need to resize your picture to 1800 pixels on the longest side and set the resolution to 300 dpi using a photo editing program, such as Photoshop Elements or one of the free programs you can download – for example, Gimp. Step 1 — Open your Picture as you normally would to view it or open the folder that contains your pictures. Step 2 – Select the picture or pictures you want to send. Then click the E-mail tab – this is usually found at the top of the screen or in one of the drop-down menus. You can select more than one picture to send at a time by clicking on the 1st one and holding down the CTRL button as you click on the 2nd picture in the folder. Step 4 – Then click Attach. The E-mail program opens with the New Message showing your picture as an attachment. Step 5 – Fill in the TO: and SUBJECT: Lines. In the Message area, be sure to include Your Name and the Title, Size and Price of each painting. Step 1 – A dialogue box appears where you enter the size you need for the entry. In the box marked Resolution type in 300. On the lower left click on the box Resample Image. Now go to the box that corresponds to the longest side of the image (Width or Height) and type in 1800. Your image is now sized for entry. Now you need to save your new sized image. Step 2 – To save the Resized Image with Photoshop Elements, go to the upper left and click on File. A drop down menu appears and you click on Save as. The “Save As” dialogue box appears where you enter the name. Make sure jpg is selected in the “Format” box. The digital files must be named as follows: last name in CAPS + first name in lower case, #1 or #2 and the title of the painting. The file format must be jpg. Example : DOEjohn #1_landscape.jpg. In the upper part of the box find the Save In area. If the folder listed is not where you want to save your resized image, use the drop down menu to locate and then click on the place where you want to save the image. Click Save. Remember where you save your image so when you email or put it on a CD it will be easy to find. Step 3 – Open Email. Fill in the TO: and SUBJECT: Lines. In the Message area, be sure to include Your Name and the Title, Size and Price of each painting. Locate the attach symbol in the menu bar and choose your file(s).